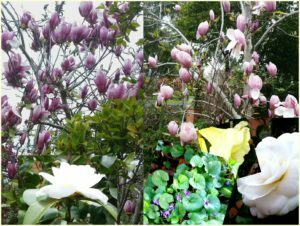 Spring has come to Melbourne with it burst of lush and colourful growth. And with it, a magical moment – the Vernal Equinox. Two fantastic aspects of the natural cycle. Do you feel the change in yourself? As the natural world literally springs into renewed life, perhaps we humans can renew, too – renewed optimism, energy and growth. Are you willing to risk all as you push up into the light, and the sun, and the rain? If you are, you will find uncertainty – you can’t be sure whether you will meet with drought, or ruinous rain, or a gentle nurturing. You cannot control outcomes, even more than the plants can, or any more than the birds can secure for certain the viability of their hatchlings. But perhaps that uncertainty is inherent in growth. And do you know what? It is only us humans who invest hope in the enterprise. Those remarkable flowers, brilliant and delicate, do not even consider themselves beautiful, nor do they feel diminished when rain starts to rot their soft petals. They don’t hope for anything. While they might “struggle” for sunlight or soil nutrients, there is no ego in it – they don’t take it personally. Flourishing is not “success”, and withering is not “failure”. It is odd, don’t you think, that we, so ordinary, are each just one amongst the billiions of us on the planet? Even knowing that each of is part of a vast mediocrity, we nevertheless rate our selves and our projects as a “success” or a “failure”. Supposing we simply allow the feeling of the rush of energy, and work with gusto at the right time – and then allow that what happens, happens? Here is another part of Spring, the Vernal Equinox when the hours of light and dark are equal. Of course, it is the perfect metaphor for living! There is no dark that does not give way to the light. And in fact, you cannot hold on to the darkness, even if you want to. The Dawn comes, just as inexorably as the Dusk comes to end the most perfect or the most horrid day. The beautiful teaching of the Equinox is that, even if the “winter of our discontent” seems very long sometimes, the time of balance, when all is put to rights, inevitably rolls around. What follows is a time of greater light in our lives. And then even that is balanced. If you suppose yourself especially gifted, or especially worthy, or especially important, or especially insightful… there will come the time of balance between you and those you have looked down on… and you will experience diminishment for a period. It is all just so natural and so predictable – you’d wonder why we get upset about the ups and downs of life. As Spring moves towards the heat of Summer we can really enjoy nature. For a while, we are no longer huddled indoors out of the cold, or staying indoors out of the heat of midsummer. Let’s enjoy this time as a time of renewal in ourselves, as well – no longer avoiding anything in ourselves. If you have a cold heart, try opening it to warmth and growth; if you have a hot temper, try mildness and moderation. At least for a month or two! I wish you the best of seasons, the best of new growth, and the delight of noticing the Spring in your soul. I am the spiritual director of the Australian College of Classical Yoga. We teach reality based spirituality. This entry was posted in Article, Satsang, Seasons and tagged article, Equinox, Satsang, Spring. Bookmark the permalink.